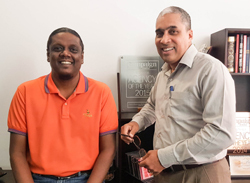 Omnicom Media Group (OMG) of Sri Lanka celebrated the New Year with the appointment of a new Chief Operations Officer (COO). Made up of 50 percent method and 50 percent madness, Alann Lopez is a welcome addition to OMG’s diverse environment. A former Ben/Alethean, Lopez comes with almost 20 years of experience in the advertising industry. Having begun his career at Thompson Associates (Ceylon) – OMG Sri Lanka’s parent company – in 1998 as a Trainee Account Executive, he went on to assume the positions of Senior Account Executive at Grant McCann, Account Manager at Masters DDB and Senior Account Manager at Lowe LDB (now known as MullenLowe).